We can become addicted both to substances and to behaviours. 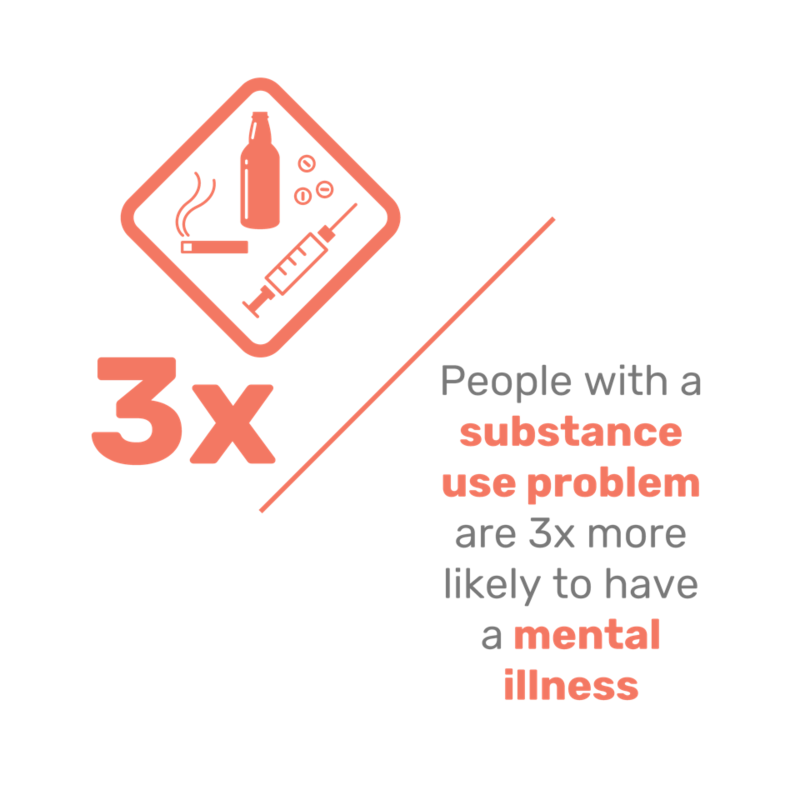 Around half of all people with addiction engage in more than one type of addictive behaviour. Addictive behaviour occurs when people repeatedly choose pleasure now without worrying about future pain.Szalavitz, M. (2016). Unbroken Brain. New York, NY: Picador, p.161. Rush et al. (2008). Prevalence of co-occurring substance use and other mental disorders in the Canadian Population. Canadian Journal of Psychiatry, 53, pp. 800-9. Addiction can be both a symptom of mental health issues, and a contributor to them. There is a very strong correlation between mental health issues and addiction.Bussing-Birks, M. (2017). ‘Mental illnsss and substance abuse’. National Bureau of Economic Research. [online] Available at: http://www.nber.org/digest/apr02/w8699.html [acccessed 2 Nov. 2017]. At least 50% of people with addiction – according to some studies, as high as 98% – have a mental health condition. Being addicted to substances or behaviours can negatively impact our mental health. It can also cause physical problems, which may in turn contribute to mental health issues. Chronic addiction can also alter the body’s biochemistry, and directly or indirectly contribute to nutritional and physiological imbalances such as hormone and neurotransmitter imbalances.Lake, J. (2009). Integrative Mental Health Care. New York, NY: W.W. Norton & Co., p.260. The long-term abuse of drugs and alcohol can contribute to structural and chemical changes in the brain. This can affect many of its functions, including our judgement, decision-making, stress levels, memory, and behaviour.National Institute on Drug Abuse. (2014). ‘Drugs and the brain’. [online] Available at: https://www.drugabuse.gov/publications/drugs-brains-behavior-science-addiction/drugs-brain [accessed 2 Nov. 2017]. Addiction can change our brain chemistry, in particular our neurotransmitter balance. For instance, heavy substance use can cause the repeated release of dopamine (a neurotransmitter controlling the brain’s pleasure centres). Over time, the brain may respond by reducing its production of dopamine, or its number of dopamine receptors.Scott, T. (2011). The Anti-Anxiety Solution. Oakland, CA: New Harbinger Publications, p. 64. We then need more of the substance to keep feeling the same levels of pleasure. This can make it harder for us to give it up, leading us to consume it in greater amounts. This in turn, can worsen the other effects of addiction. Chronic alcoholism and drug addiction can contribute to a range of nutritional deficiencies and blood sugar issues. These in turn can contribute to, or exacerbate our mental health symptoms, and increase our desire to self-medicate further. Mineral and electrolyte imbalances are extremely common among addicted individuals, due to a poor diet and regular diarrhoea. This can lead to the depletion of natural stores of copper, iron, magnesium, and zinc. It may also cause deficiencies in sodium, calcium, or potassium, which can, in extreme circumstances, prove fatal.Nabipour, S., Ayu Said, M., Hussain Habil, M. (2014). ‘Burden and nutritional deficiencies in opiate addiction – systematic review article’. Iranian Journal of Public Health, 43(8), pp.1022–1032. Many alcoholics have abnormally low blood levels of vitamins A, B (especially thiamine, folate, and B6), and C, all of which are essential to mental health. In particular, a lack of vitamin B6 can cause mental confusion and skin problems, while a lack of B1 can cause alcoholic dementia and cardiovascular issues.Lake, J. (2009). Integrative Mental Health Care. New York, NY: W.W. Norton & Co., pp. 260–265. Addicted people often show marked deficiencies in certain essential fatty acids, which are central to the brain’s production of hormones and other brain chemicals, and therefore to our mental health.Lake, J. (2009). Integrative Mental Health Care. New York, NY: W.W. Norton & Co., p. 261. Consuming high levels of caffeine and sugar can cause hypoglycaemia, which can trigger symptoms of anxiety, mood swings, and impaired cognitive function.Lake, J. (2009). Integrative Mental Health Care. New York, NY: W.W. Norton & Co., p. 263. Research suggests that alcohol consumption can increase homocysteine levels, which are associated with heart disease.Bleich, S., Bleich, K., Kropp, S., Bittermann, H.-J., Degner, D., Sperling, W., Rüther, E., Kornhuber, J. (2001). Moderate alcohol consumption in social drinkers raises plasma homocysteine levels: a contradiction to the “French Paradox”?’ Alcohol and Alcoholism, 36(3), pp. 189–192. Different addictive substances can affect our minds and bodies in different ways. Three of the most common, especially in affluent Western society, are caffeine, alcohol, and recreational drugs. Caffeine is a stimulant, which is why drinking a cup of coffee or a caffeinated soda gives us a temporary surge of energy. Coffee is also full of antioxidants, and can have a healthy impact on the brain. Some people can consume a lot of coffee without showing any ill effects. In the case of caffeinated sodas, however, the sugar they contain may also be detrimental to our mental health, so it can be doubly damaging. While at first it has a calming, relaxing effect, alcohol can subsequently increase our levels of cortisol (the stress hormone), leading to anxiety, and it often has a depressive effect as well. Severe cases of alcohol intoxication and/or withdrawal can cause symptoms that are ‘sometimes mistakenly interpreted as a primary psychiatric or medical disorder’:Lake, J. (2009). Integrative Mental Health Care. New York. NY: W.W. Norton & Co., p. 260. These symptoms may put a strain on relationships with family and friends, and can often interfere with the individual’s ability to function at work. Alcohol can also cause nutritional imbalances, neurotransmitter imbalances, and blood sugar issues. Being a toxic substance, there are numerous ways in which it can damage our bodies:Perlmutter, D., Colman, C. (2004). The Better Brain Book. New York, NY: Riverhead Books, p. 27. Recreational drugs can be highly addictive, sometimes causing addiction after only a single use, and once someone is addicted to them, it can become extremely difficult to stop taking them. Depending on the substance used and the biochemistry of the user, taking recreational drugs may also prove fatal, whether after a period of chronic use or even a single use (through an overdose or a ‘bad reaction’). While addiction is a key contributor to mental health issues, those issues can often be contributors to addiction too. There is no one factor alone which can cause or prevent addiction. It’s the result of a combination of factors, which include stress, trauma, genetic disposition, biochemical imbalances, and more.Sheff, D. (2014) Clean. New York, NY: Mariner, p. xi. But people with undiagnosed or untreated mental health issues often want to alleviate their symptoms, or distract themselves. As a result, they may try to self-medicate with addictive substances and/or behaviours. This means that we can view some mental health issues as contributors to addiction. People with Asperger syndrome and autism are predisposed to over-learning, and so their repetitive habits can become more deeply rooted over time. A primary symptom of ADHD is impulsivity, and impulsive behaviour is often associated with drug use. Around 20% of people who abuse narcotics have ADHD, at least four times higher than that seen in the general population.Szalavitz, M. (2016). Unbroken Brain. New York: Picador, p. 54. ADHD has also been shown to be a significant risk factor when combined with nicotine and alcohol consumption.Ohlmeier, M., Peters, K., Kordon, A., Seifert, J., Te Wildt, B., Wiese, B., Ziegenbein, M., Emrich, H. and Schneider, U. (2007). Nicotine And Alcohol Dependence In Patients With Comorbid Attention-Deficit/Hyperactivity Disorder (ADHD). Alcohol and Alcoholism, 42(6), 539–543. Available at: https://pdfs.semanticscholar.org/422b/2a5b3137e13e3b72f27d507623bbe58fde2a.pdf [Accessed July 2016]. This use can quickly turn into dependence. It is worth noting, however, that the risks of dependence are often overstated. For instance, the prescription of stimulant drugs to treat ADHD has been blamed in the media for drug addiction. But one long-term study, which followed one hundred boys with ADHD for ten years, showed no increased risk of substance abuse in the boys who took medication.Molina, B., Pelham, W. (2014.) ‘Attention-Deficit Hyperactivity Disorder and risk of substance use disorder’. Annual Review of Psychology, 10, pp. 607–639. Many addictive substances are legal and readily available, such as alcohol, cigarettes, and prescription medication. Some people can use them at various intervals and never become addicted, while others can develop an addiction after only a single use. We all have different levels of tolerance. In the U.S., the National Institute on Alcohol Abuse and Alcoholism has estimated that ‘87% of adult Americans drink, yet 87% of Americans are not alcoholics’.Grace, A. (2015). This Naked Mind: Control Alcohol, Find Freedom, Rediscover Happiness and Change Your Life. ASPN Publications, p. 40. In fact, only ’10 to 20%’ of people who try even ‘the most stigmatised drugs like heroin, crack, and methamphetamine’ end up addicted to them.Szalavitz, M. (2016). Unbroken Brain. New York, NY: Picador, p. 4. But when someone does have a tendency towards addiction, occasional use can swiftly become habitual. There is no single ‘gene for addiction’, but addiction does tend to run in families. Research has shown that:Enoch, M.A., Goldman, D. (2001). ‘The genetics of alcoholism and alcohol abuse’. Current Psychiatry Reports, 3(2), p. 144–151. But even if someone has a genetic predisposition to addiction, the genetic heritability of addiction ranges between 40–60%, which leaves a lot of scope for environmental factors and lifestyle decisions.Szalavitz, M. (2016). Unbroken Brain. New York, NY: Picador, p. 63. How genetic factors impact our mental health. An exposure to addictive substances during our childhood or adolescence increases the risk of developing addiction. The brain is still developing, and therefore more vulnerable to addictive substances and patterns.Szalavitz, M. (2016). Unbroken Brain. New York, NY: Picador, p.38.Szalavitz, M. (2016). Unbroken Brain. New York, NY: Picador, p.4.Dupuy, J. (2013). Integral Recovery. Albany, NY: State University of New York Press, p. 3. It is also in adolescence that we develop our main coping strategies and behavioural patterns for our adult lives. Drug and alcohol use can interfere with this process:Arain, M., Haque, M., Johal, L., Mathur, P., Nel, W., Rais, A., Sandhu, R., Sharma, S. (2013). ‘Maturation of the adolescent brain’. Neuropsychiatric Disease and Treatment, 9: 449–461. Psychological trauma, particularly in childhood, can be a major contributor to addiction. Losing a parent to divorce or death. The Adverse Childhood Experiences (ACE) study, which included some 17,000 participants in California’s Kaiser Permanente insurance program, found multiple relationships between severe childhood stress and many types of addiction.Kim, V. (2017). ‘The link between opioid misuse and childhood trauma’. The Fix. [online] Available at: https://www.thefix.com/link-between-opioid-misuse-and-childhood-trauma [2 Nov. 2017]. Heroin users provide an especially clear example of this relationship:Szalavitz, M. (2016). Unbroken Brain. New York, NY: Picador, p. 65. How psychological trauma can impact our mental health. Someone going through a very difficult time, involving trauma, relationship difficulties, or tough socio-economic circumstances, may become addicted when under more favourable circumstances they would not. While in the short term the substance or behaviour can make us feel better, in the long term it can make us feel much worse, and have a negative impact on our mental health. Some argue that being exposed to addictive substances can turn anyone into an addict, and that repeated exposure increases the likelihood of addiction.Grace, A. (2015). This Naked Mind: Control Alcohol, Find Freedom, Rediscover Happiness and Change Your Life. ASPN Publications, p. 42. When we consume them, the brain releases neurotransmitters such as serotonin and dopamine, which can lead to feelings of pleasure and relaxation but also cause cravings for more. The more we use the substance, the more our tolerance to it may increase, meaning that we need a greater amount of it to give us the same ‘good’ feeling. Our brain regulates the levels of hormones in our bodies, and when it detects an imbalance it triggers hormone production. This can have the side-effect of mental health symptoms, and these make us vulnerable to addictive behaviour or substances.Sat Dharam Kaur. (2016). ‘The Gut, the Brain and Addiction’. Beyond Addiction. [online] Available at: http://beyondaddiction.ca/2016/09/04/gut-brain-addiction/ [accessed 2 Nov. 2017]. The nutritional deficiencies resulting from addiction can also make recovery harder. If we aren’t digesting and absorbing sufficient nutrients, our brains won’t trigger the correct neurotransmitters and hormones. Kathleen DesMaisons has argued that people who suffer from ‘sugar sensitivity’ are especially prone to addiction. When they consume carbohydrates, an extremely powerful blood-sugar response can be triggered, releasing opioids and dopamine in their brains and giving feelings of pleasure. People with this nutritional imbalance, she suggests, are prone to a sugar addiction that, if left untreated, ‘can open the gate to other addictions’.DesMaisons, K. (2008). Potatoes Not Prozac. New York, NY: Simon & Schuster, p. 3. Our modern Western lifestyles also emphasise material gain and success. As a result, when people are poor or unsuccessful, they may feel inadequate or seek pleasure wherever they can, and this need to ‘fill the void’ can lead to substance abuse. As the Jungian psychologist Robert Johnson makes clear: ‘Addiction is nothing other than a severely degraded substitute for the true experience of joy’.In Chopra, D. (1997). Overcoming Addictions. New York, NY: Harmony Books, p. 6. Through a combination of genetic, biochemical, and psycho-spiritual factors, certain people may have a personality more prone to addiction than others. The ‘Addictive Personality’ model argues that this is the case: some people are born with inherently addictive personalities, and if these people are exposed to addictive substances, they will become addicts.Jampolsky, L. (2008). Healing The Addictive Personality. Berkeley, CA: Celestial Arts, p. 4. But, while some character traits are traditionally associated with addiction, to view it as an inherent part of someone’s personality can disempower that person, by assuming that their addiction is inevitable.